Passengers are welcome to board our ship at 3:00 p.m. in Lyon. 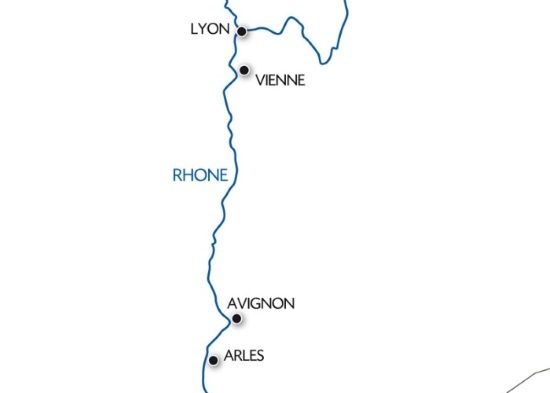 After comfortably settling into your cabins, we'll begin to cruise to Arles. Enjoy a welcome cocktail with the crew before dinner. Our ship will cruise through the night. We'll spend this morning sailing. Join us for a guided visit of Arles, listed as a City of Art and History. We'll cruise towards Avignon. Join us for an excursion to visit the city and the Papal Palace. We'll return on board and continue our cruise towards Vienne. Tonight is our gala dinner and evening. Our ship will cruise through the night. Join us for a tour of Vienne and its Roman vestiges. We'll then return on board and continue to cruise to Lyon. Upon arrival, join us for a visit of the city. Tonight is our special New Year's Eve dinner and evening. Enjoy a unique cruise on the Rhone and celebrate the New Year in Lyon! You will have the opportunity to discover Arles and its fascinating heritage going back more than 2,500 years, but also the city of Avignon, capital of the Vaucluse and Côtes du Rhône, city of the Popes, art and museums. Get ready to be charmed away by this surprising cruise!